Habit: upright tap rooted plant with several spreading stems. The blue-green leaves are mainly basal and lobed. Leaves are divided into multiples of three leaflets, with each leaflet also subdivided into 3 smaller lobed leaflets that overlap one another. Several nodding flowers, of deep red-orange and yellow, bloom from April to August on a mostly leafless stem. 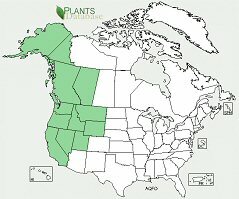 Ecology: red columbine can be found in many kinds of habitats including moist meadows, streambanks, oak woodland, mixed-evergreen or coniferous forest; from the lowlands to timberline. Growing Conditions: full sun or filtered shade with fertile, moist, well-drained soil, very low salt tolerance. 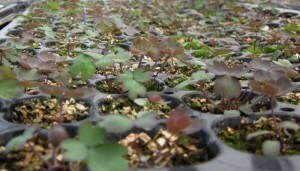 Aquilegia comes from the Latin word aquil, meaning eagle, referring to the shape of the petals. 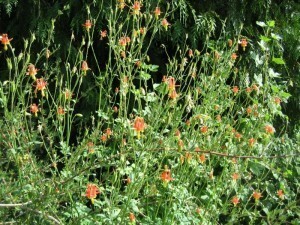 The red columbine is a good nectar source for hummingbirds, bees and butterflies. Other birds such as finches and sparrows eat the seeds. The flowers are edible, with sweet nectar spurs that rise above the flower, however the seeds can be fatal if eaten.